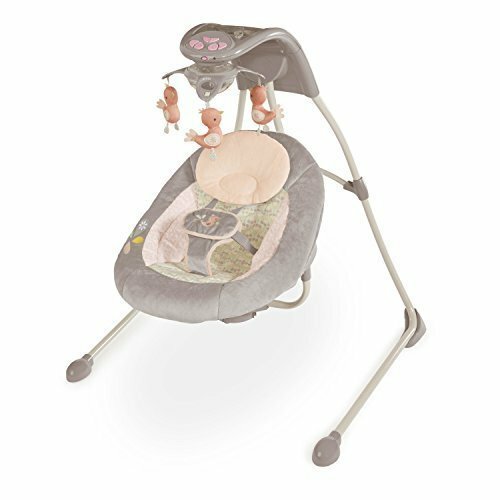 InLighten Cradling Swing in Piper is amazing parents all over the world with its ConnectMe feature that allows mom and dad to connect a smart device to entertain baby with pictures, videos, and more. The LightBeams electronic mobile keeps baby happy with moving lights and plush toys. This innovative swing rotates 180 degrees so baby is always in view, and baby can swing in 2 directions. There are2 recline positions to choose from, plus a deluxe oversized seat with a removable head support to keep baby secure and comfortable. An AC adaptor means big savings on batteries. And the InLighten Cradling Swing is great for on the go its SlimFold frame design provides easy folding for room-to-room portability and storage. Choose from 8 melodies and 3 nature sounds, along with 6 different swing speeds and 3 timer settings. 5-point harness and easy to clean seat pad. Swing timer offers 3 settings: 30, 45, and 60 minutes.